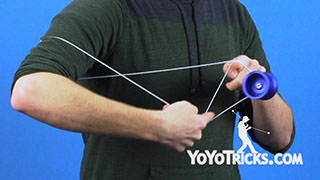 Now to learn this trick, you want to make sure that you know how to do the Wrist Mount, so go ahead and check out our video on that if you have not already. 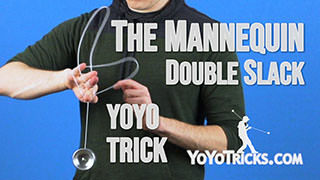 In the trick we are going to get into the wrist mount two different times. These are just some great combinations to do when you are in a wrist mount. 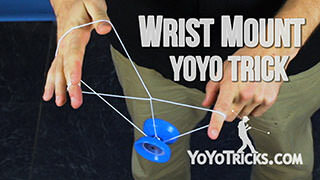 To start off, you can get into the wrist mount however you like. Once we are in it, we are going to take this triangle at the top, and our opposite index finger. 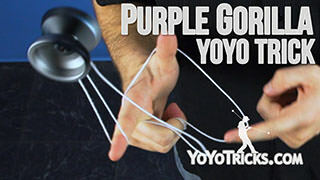 We are going to grab the string that is closest to our body. Pull it apart. 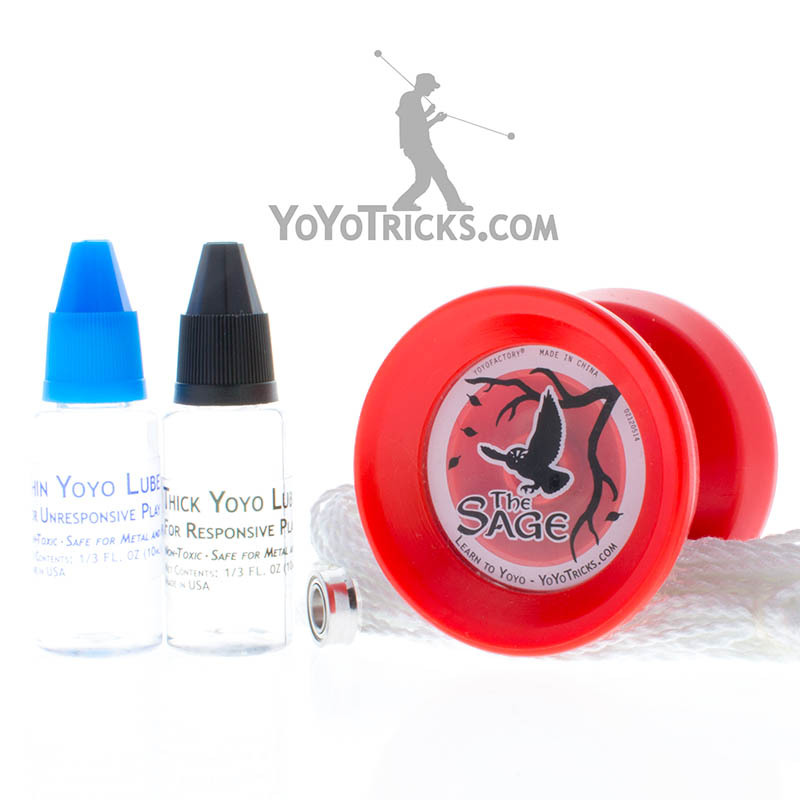 You will see that this gives us a nice, big hole that we can pop the yoyo up through. We are going to land on to that front string. 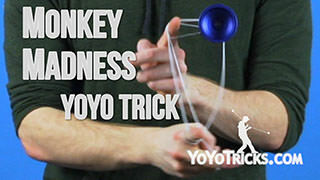 From here we are going to pop up and land it on the back string that is closest to our body. 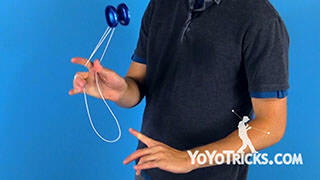 Then here you will see that there is the string coming around my opposite index finger. There is a string in the back coming around my throwhand. 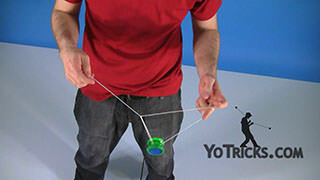 And then there is also this string here, that is coming right from the yoyo. What we are going to do is press our opposite index finger onto the strings. 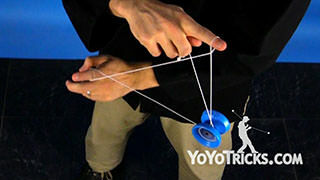 Then roll, underpass onto the string attached to the yoyo. It is the one furthest from our body. 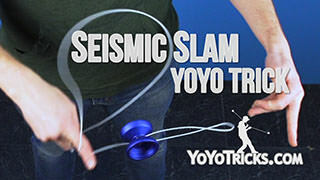 Then you can drop your throwhand right out. 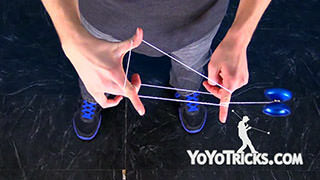 The strings come out with no knots. 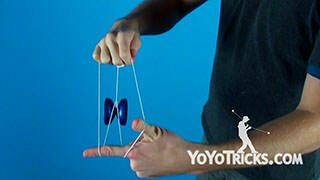 Then you can roll the yoyo around the outside of your hands. 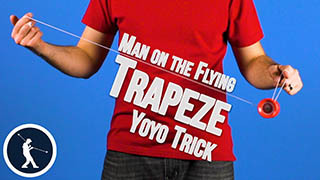 You will end up right back into a Trapeze. From here we are going to figure out how to get back into the wrist mount. 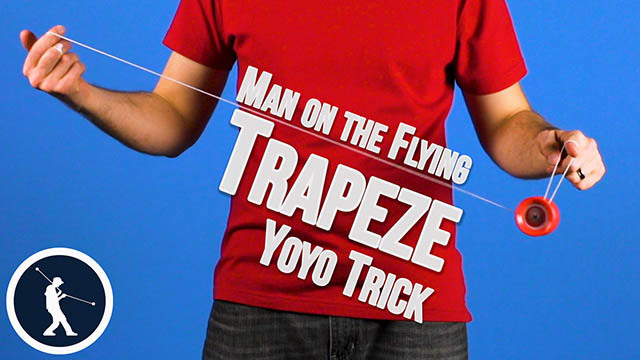 From our trapeze, we are going to wrap the string around our hand, spread it apart, and we are going to lift the yoyo up through the loop and get right back into a wrist mount. 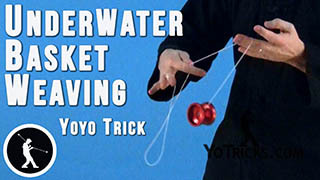 Now there are a number of tips as you are trying to do that part of the trick. 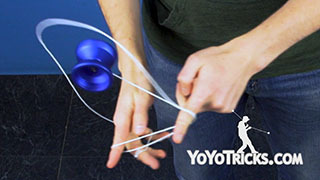 The biggest one is that when you wrap the string around, insert your thumb here to make that loop. You do not want to make your hand really flat like this because then there is no space for the yoyo to pass through. You want to make a nice C shape, a nice arc. 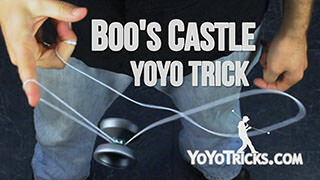 So when you come around, you spread it around, you can see now there is a nice area that the yoyo can actually fit through. 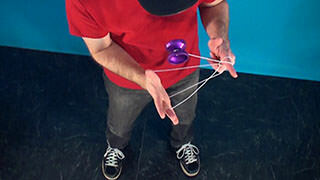 Also you will see that I have got the string here in alignment with the center. I do not have it off to the side at all. The more straight and aligned it is, the easier it will be. 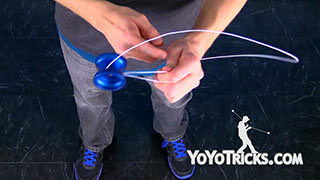 The last tip is that you want to keep that string coming around the bottom. Not only in alignment, but very taut. 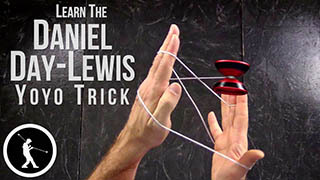 So when you do the trick, you actually do not want to pinch and lift. You can see that makes a lot of slack. 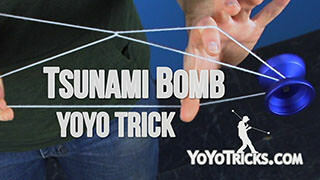 When you do that, it actually makes it very hard to hit the trick. 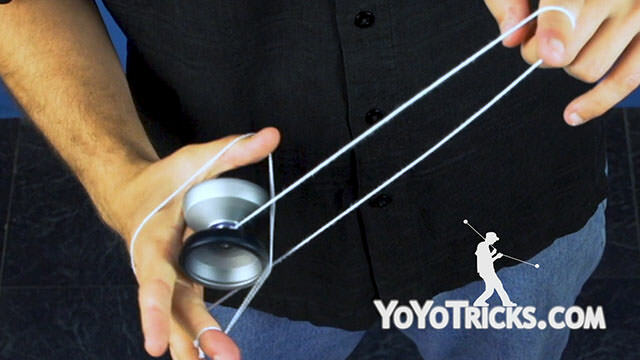 When you drop through, the string can move to either side. Instead, what you want to do is get your loop formed. 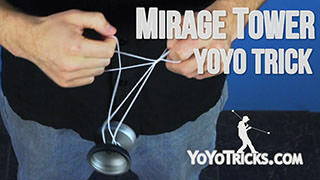 Then you want to lift up and you can see how that keeps the string taut so when I slide the yoyo in, it almost slides right in on its own, it kind of aims itself. 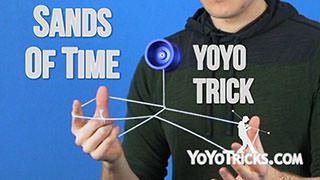 So that is how you get back into the wrist mount. 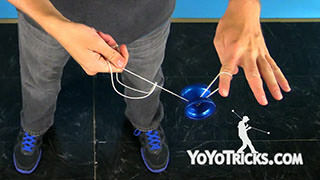 Now the second part of the trick, since we are in that wrist mount again, what we are going to do is stick our index finger in. Do an underpass. 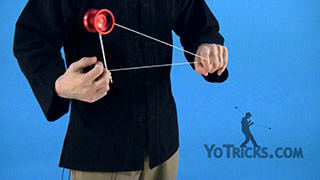 Then we are going to pop the yoyo up towards ourself and land it onto this top string here. Just like that. Then what we are going to do is pop it up again. We are going to cross our hands with our throwhand going over top. 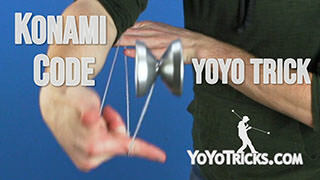 We are going to land it onto the same string, but with the arms crossed. You will see that puts you into a Green Triangle. 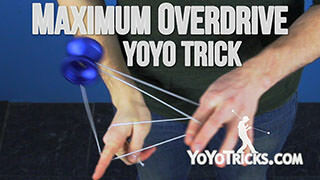 You can then pop that out the front, land into a trapeze, and bring yoyo back to your hand however you would like. 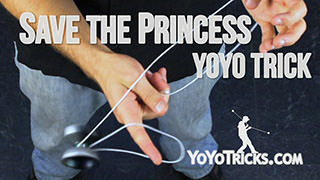 Now, once you complete the trick, you are going to get all done, and you know of course you are going to find out that the princess is actually in another castle, but that is how you do Mario and Luigi.